Moderating a panel can be done in many different ways. Harvard Business Review has a post with a dozen guidelines and gets your attention in the beginning. I take a different approach in moderating a panel than many as I have a different objective. The way others moderate a panel is not wrong, it is a different style. First question to ask is why are you moderating the panel. Did you bring the speakers together to present on a topic you care about? Do you want to be in a position of questioning a thought leader in the industry? Is this part of your job working/volunteering for a conference? When I am moderating a panel most of the time I focus on how can the panelists present a story that the audience wants to hear and sees value in listening to? First task is to research and get background on the speakers. I then spent some time with the PR folks who interact with the executives to brainstorm what the executives are passionate about. Next the executives typically wanted a 1/2 hr prep call to go over format, venue, schedule, and overall flow. We then scheduled time to connect at the GigaOm Structure conference. One of the challenges we had is Dave Giambruno had a great story on how Revlon IT has created its own private cloud environment and having him try to explain in a narration would be difficult. So, breaking with typical panel format, Dave had 10 slides that told the Revlon story. Dave Giambrunos is proud of his empty data center space that has LED lighting as a prominent feature. After the Dave finished the slides, we wanted to transition to what is next. The future of innovation in IT which is a nice hand off to give Cynthia Stoddard CIO of NetApp. The conversation was moving well between Dave and Cynthia discussing the future of IT from a CIO perspective. Then, I saw an opening to introduce the concept of the cultures that Dave and Cynthia support for taking risks, being agile, and supporting the business growth. As a port mortem we were all chatting, Cynthia and Dave were pleased people were taking pictures of the slides and taking notes. We ended on time so we escaped the wrath of Joe Weinman the overall MC of the event. It was an experiment to try and present slides, and in 20 minutes Dave and Cynthia covered a lot of material. The slides I inserted in this post are only 3 of the 10. 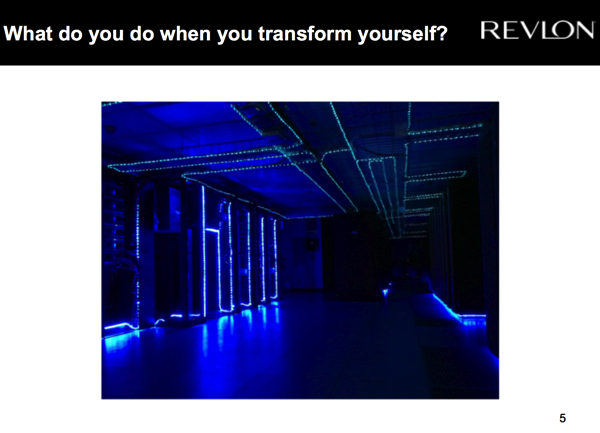 In the end I learned more about Revlon's IT efforts and got better appreciation of NetApp's IT as well. The message for CIO's to support innovation using the cloud and converged infrastructure was a subtle message, not prominent in your face. The focus was on the business. Not the IT business, but the business of the company that IT needs to support to be successful. Also, they one thing I like about my technique/style is how the story is told can change. You can experiment. Try new ways to moderate a panel.